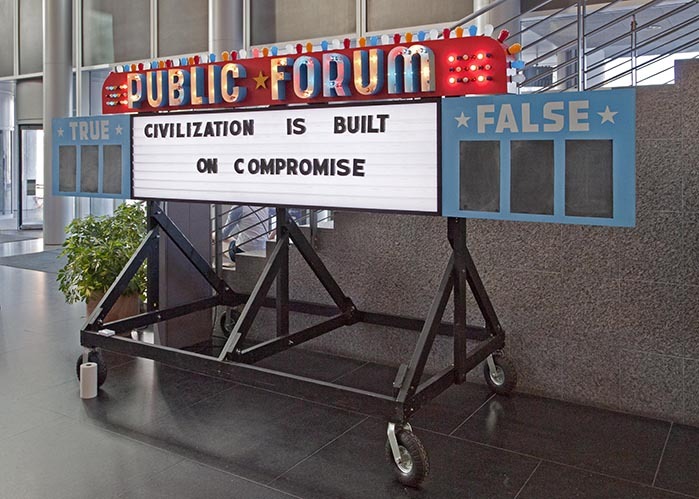 PUBLIC FORUM is a responsive, interactive art work bringing critical thought and movement to entrenched and fossilized ideas about our culture. The piece uses direct, community based democracy combined with game-show and carnival elements and a touch of absurdity. PUBLIC FORUM creates a large scale backdrop for discussion of philosophical ideas and political myths in Kitchener. Imagine a mix of Family Feud, Let's Make a Deal, the front page of the newspaper, and the best college seminar class you ever took. The 14ft wide lighted sculpture includes a theater marquee, a manual scoreboard, and hundreds of flashing lights. Passers by become players in the game, being interviewed by a host about their life and background, and then asked to respond to various philosophical topics. Rather than a simple quiz on facts, the game would tally public sentiment and score differently depending on the knowledge, experience, and "wildcard" factors presented by the player. Together all the elements make a well-moderated and fun conversation around statements like "Civilization is built on compromise," "Love is all you need," "Kitchener is the best it can be" or "True freedom is freedom from want." The dialogue around these ideas would unravel and create shifts in thinking through more complex understandings. And of course, jokes and laughter. Topics can be suggested by participants and the statements will change frequently. Location: Conestoga Mall, 550 King St N, Waterloo, ON N2L 5W6 and Dundas Square, 1 Dundas St E, Toronto, ON M5B 2R8. Curated by Sharon Switzer with Art in Transit. "Movies and events that happen in Conestoga Mall and Dundas Square have endings. When we eat a meal there, that meal ends. Our visit to the square and mall begins and ends. Our lives begin and end. But the advertising doesn't end. The video commercials in Conestoga Mall and Dundas Square are on a continuous loop throughout the day. One ad follows another and then they repeat. The ads show fantasies of youth, leisure, romance, and power that also, apparently, will never end if you continue to buy the product. I can't end advertising in Conestoga Mall and Dundas Square permanently with this art project, but I can end it – in my own way – for about 8 seconds. Lambert made international news after the 2008 US election with The New York Times Special Edition,a replica of the “paper of record” announcing the end of the wars in Iraq and Afghanistan and other good news. In the Summer of 2011 he began a national tour of Capitalism Works For Me! True/False – a 9 x 20ft sign allowing people to vote on whether capitalism worked for them . He has collaborated with groups from the Yes Men to the Graffiti Research Lab and Greenpeace. He is also the founder of the Center for Artistic Activism, the Anti-Advertising Agency, Add-Art (a Firefox add-on that replaces online advertising with art) and SelfControl (which blocks grownups from distracting websites so they can get work done). Steve Lambert's project has been supported in part by Pattison.